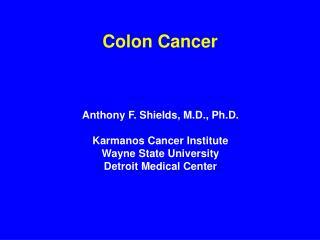 Anthony Wayne Lacrosse. Attack. 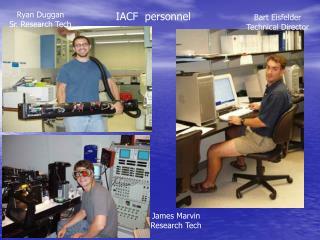 Attackmen. 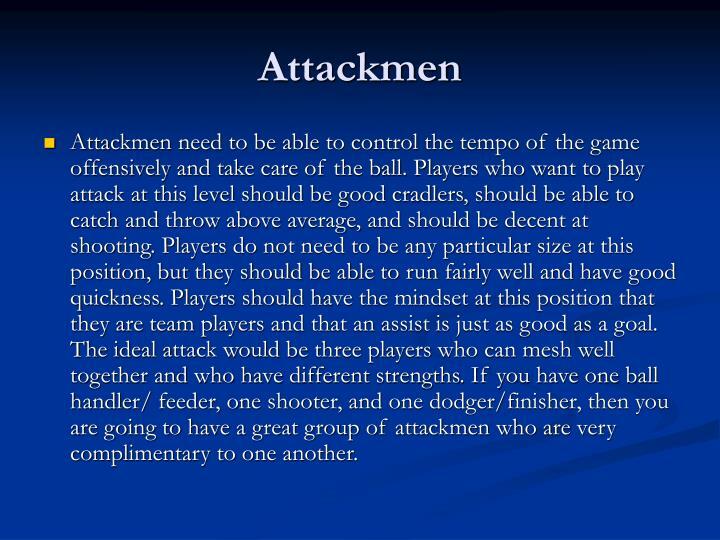 Attackmen need to be able to control the tempo of the game offensively and take care of the ball. Players who want to play attack at this level should be good cradlers, should be able to catch and throw above average, and should be decent at shooting. Players do not need to be any particular size at this position, but they should be able to run fairly well and have good quickness. Players should have the mindset at this position that they are team players and that an assist is just as good as a goal. The ideal attack would be three players who can mesh well together and who have different strengths. If you have one ball handler/ feeder, one shooter, and one dodger/finisher, then you are going to have a great group of attackmen who are very complimentary to one another. The first dodge that attackmen should have down pat is the split dodge. This dodge will allow them to set up a variety of moves. The split dodge is similar to a stutter step in any other sport. It would be the equivalent of Allen Iverson doing a cross-over in basketball or Michael Vick juking a linebacker in football. 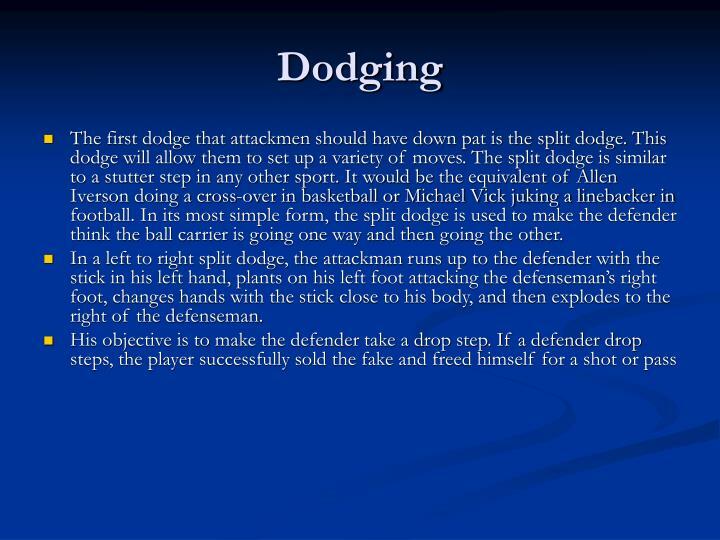 In its most simple form, the split dodge is used to make the defender think the ball carrier is going one way and then going the other. In a left to right split dodge, the attackman runs up to the defender with the stick in his left hand, plants on his left foot attacking the defenseman’s right foot, changes hands with the stick close to his body, and then explodes to the right of the defenseman. 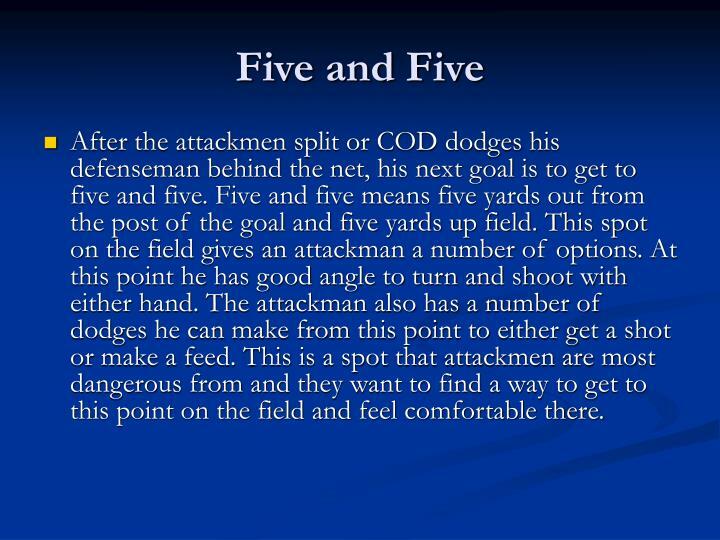 Another dodge that can free an attackman from his defender is the COD or change of direction dodge. 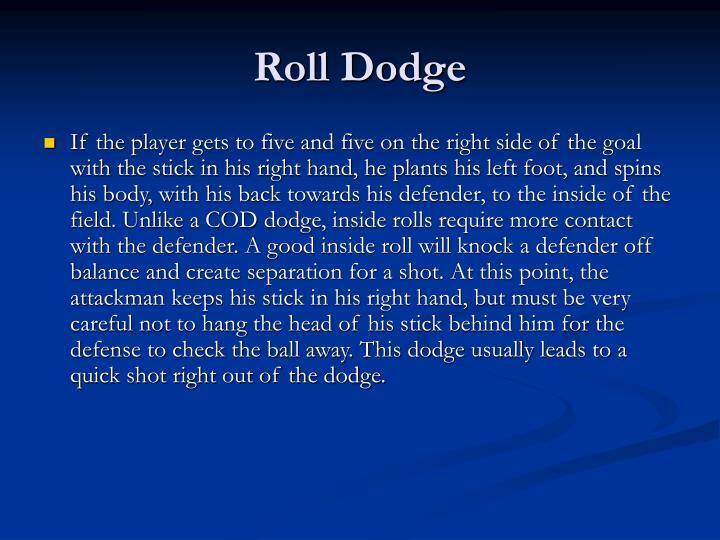 Some players are taught another version of the COD dodge early in their careers, the roll dodge. 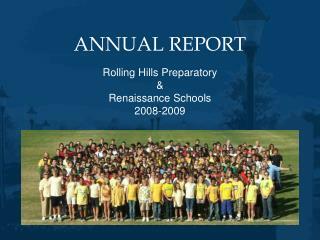 However, as players advance, the effectiveness of a roll dodge becomes increasingly limited. 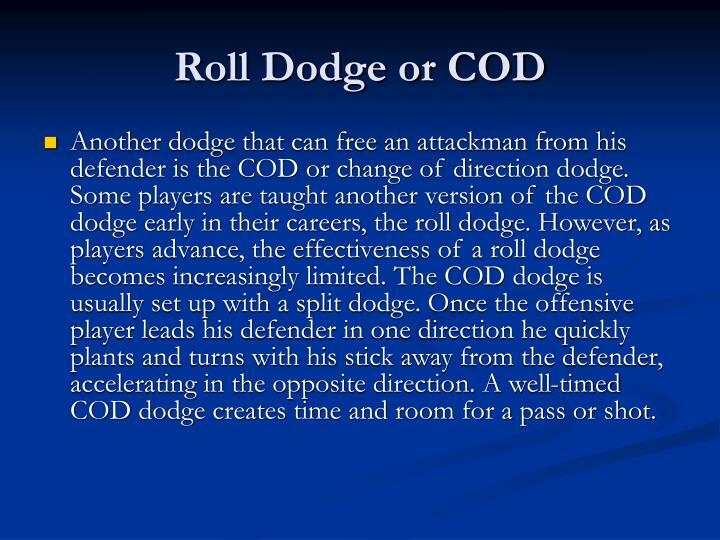 The COD dodge is usually set up with a split dodge. Once the offensive player leads his defender in one direction he quickly plants and turns with his stick away from the defender, accelerating in the opposite direction. A well-timed COD dodge creates time and room for a pass or shot. After the attackmen split or COD dodges his defenseman behind the net, his next goal is to get to five and five. Five and five means five yards out from the post of the goal and five yards up field. This spot on the field gives an attackman a number of options. At this point he has good angle to turn and shoot with either hand. The attackman also has a number of dodges he can make from this point to either get a shot or make a feed. This is a spot that attackmen are most dangerous from and they want to find a way to get to this point on the field and feel comfortable there. If the player gets to five and five on the right side of the goal with the stick in his right hand, he plants his left foot, and spins his body, with his back towards his defender, to the inside of the field. Unlike a COD dodge, inside rolls require more contact with the defender. A good inside roll will knock a defender off balance and create separation for a shot. At this point, the attackman keeps his stick in his right hand, but must be very careful not to hang the head of his stick behind him for the defense to check the ball away. This dodge usually leads to a quick shot right out of the dodge. 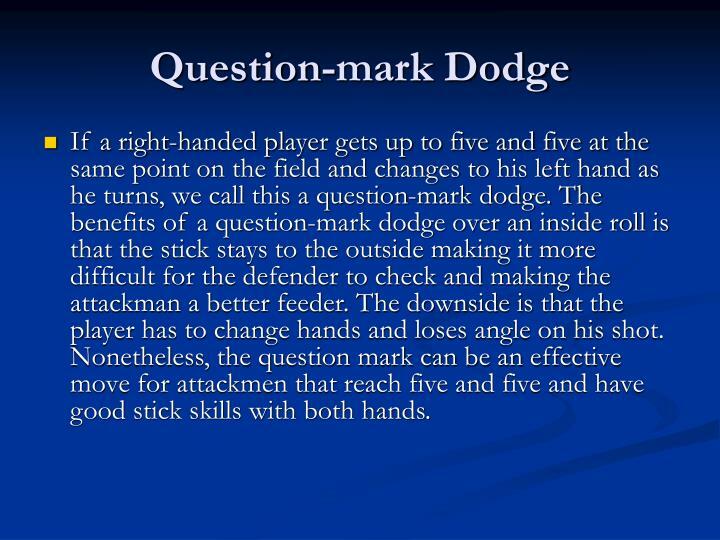 If a right-handed player gets up to five and five at the same point on the field and changes to his left hand as he turns, we call this a question-mark dodge. The benefits of a question-mark dodge over an inside roll is that the stick stays to the outside making it more difficult for the defender to check and making the attackman a better feeder. 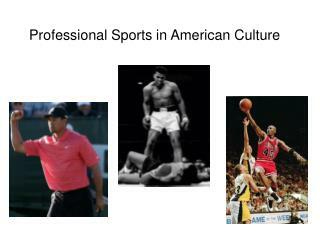 The downside is that the player has to change hands and loses angle on his shot. Nonetheless, the question mark can be an effective move for attackmen that reach five and five and have good stick skills with both hands. 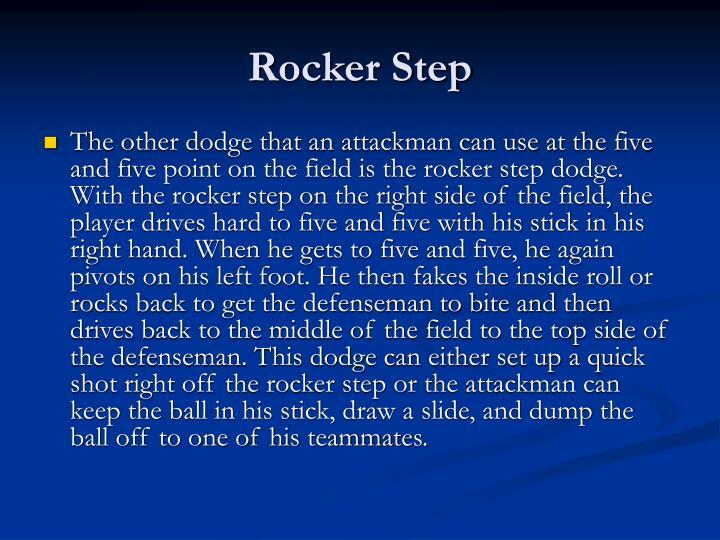 The other dodge that an attackman can use at the five and five point on the field is the rocker step dodge. With the rocker step on the right side of the field, the player drives hard to five and five with his stick in his right hand. When he gets to five and five, he again pivots on his left foot. He then fakes the inside roll or rocks back to get the defenseman to bite and then drives back to the middle of the field to the top side of the defenseman. This dodge can either set up a quick shot right off the rocker step or the attackman can keep the ball in his stick, draw a slide, and dump the ball off to one of his teammates. 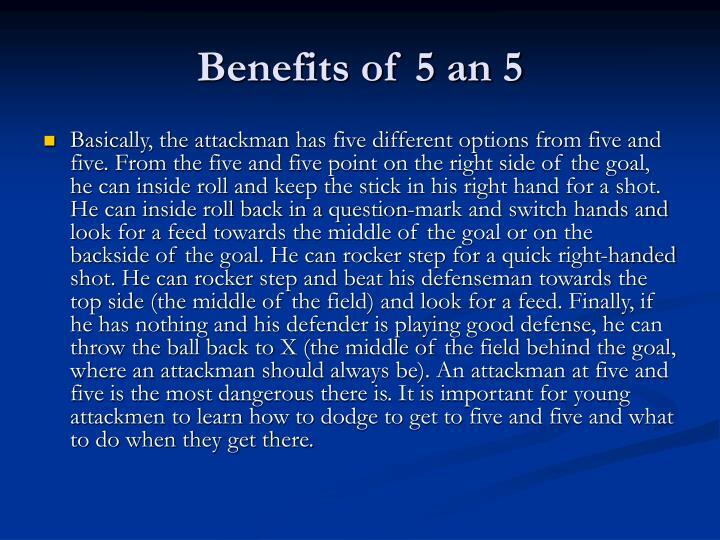 Basically, the attackman has five different options from five and five. From the five and five point on the right side of the goal, he can inside roll and keep the stick in his right hand for a shot. He can inside roll back in a question-mark and switch hands and look for a feed towards the middle of the goal or on the backside of the goal. He can rocker step for a quick right-handed shot. 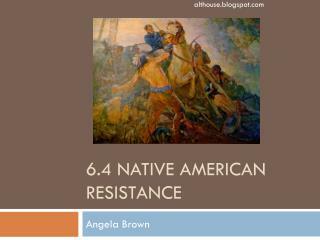 He can rocker step and beat his defenseman towards the top side (the middle of the field) and look for a feed. Finally, if he has nothing and his defender is playing good defense, he can throw the ball back to X (the middle of the field behind the goal, where an attackman should always be). An attackman at five and five is the most dangerous there is. 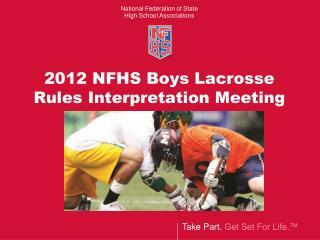 It is important for young attackmen to learn how to dodge to get to five and five and what to do when they get there. 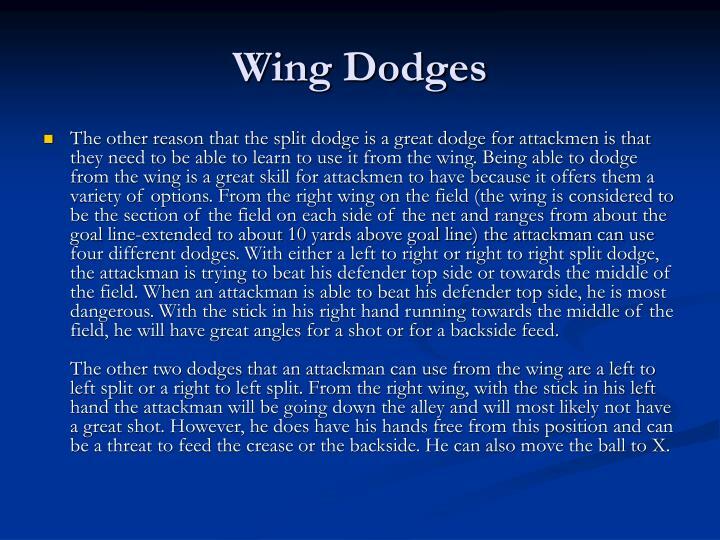 The other reason that the split dodge is a great dodge for attackmen is that they need to be able to learn to use it from the wing. 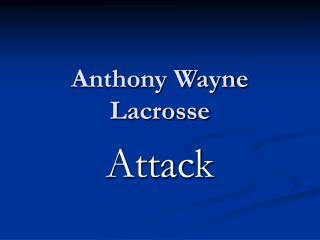 Being able to dodge from the wing is a great skill for attackmen to have because it offers them a variety of options. From the right wing on the field (the wing is considered to be the section of the field on each side of the net and ranges from about the goal line-extended to about 10 yards above goal line) the attackman can use four different dodges. With either a left to right or right to right split dodge, the attackman is trying to beat his defender top side or towards the middle of the field. When an attackman is able to beat his defender top side, he is most dangerous. With the stick in his right hand running towards the middle of the field, he will have great angles for a shot or for a backside feed. 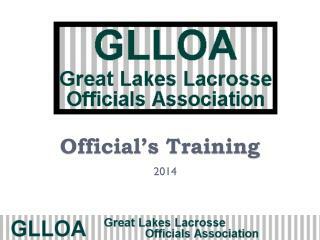 The other two dodges that an attackman can use from the wing are a left to left split or a right to left split. From the right wing, with the stick in his left hand the attackman will be going down the alley and will most likely not have a great shot. However, he does have his hands free from this position and can be a threat to feed the crease or the backside. 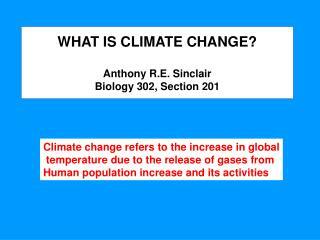 He can also move the ball to X. 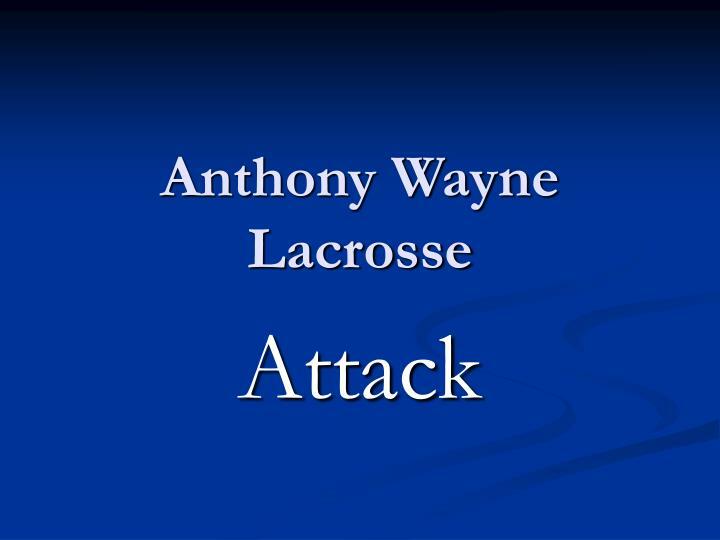 Many times an attackman catches the ball and sees a defenseman running hard at his stick to prevent him from shooting or getting to the middle of the field where he is more dangerous. As the attackman catches the ball, they can fake a shot and pull their stick across in one motion, which causes their defenseman to over commit. 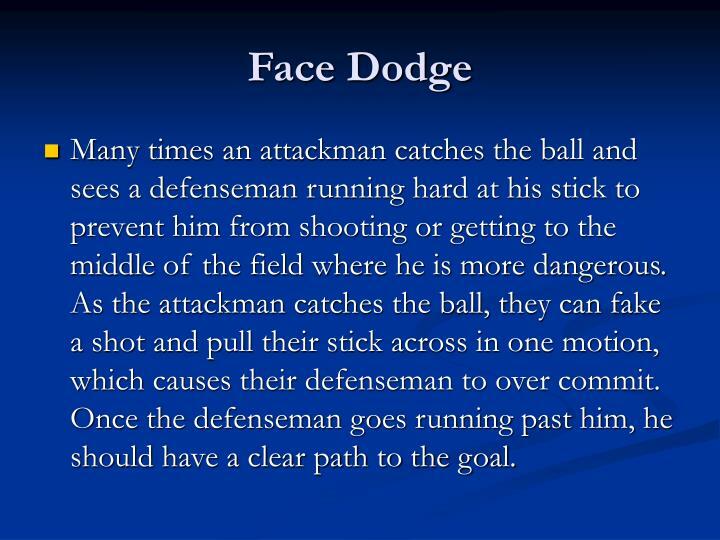 Once the defenseman goes running past him, he should have a clear path to the goal. 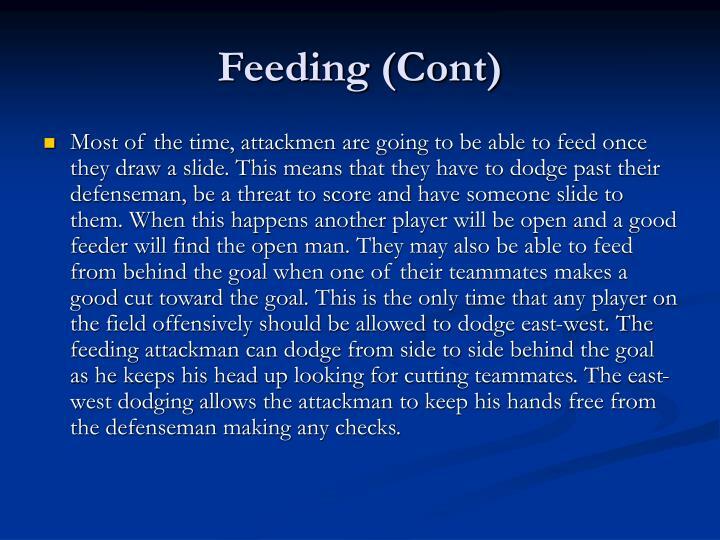 Another skill that is important for intermediate attackmen to work on is feeding. 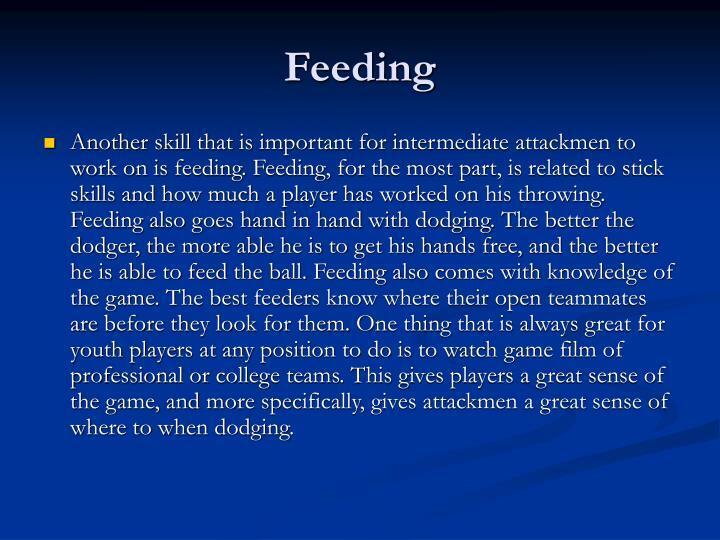 Feeding, for the most part, is related to stick skills and how much a player has worked on his throwing. Feeding also goes hand in hand with dodging. 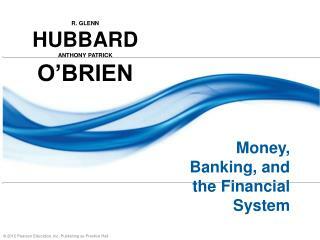 The better the dodger, the more able he is to get his hands free, and the better he is able to feed the ball. 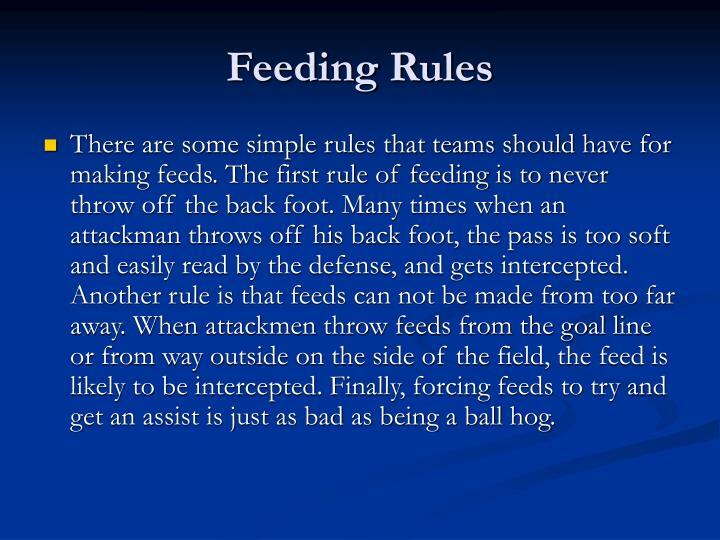 Feeding also comes with knowledge of the game. The best feeders know where their open teammates are before they look for them. One thing that is always great for youth players at any position to do is to watch game film of professional or college teams. This gives players a great sense of the game, and more specifically, gives attackmen a great sense of where to when dodging. Most of the time, attackmen are going to be able to feed once they draw a slide. This means that they have to dodge past their defenseman, be a threat to score and have someone slide to them. When this happens another player will be open and a good feeder will find the open man. 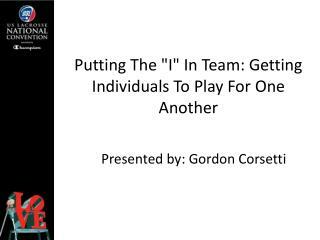 They may also be able to feed from behind the goal when one of their teammates makes a good cut toward the goal. This is the only time that any player on the field offensively should be allowed to dodge east-west. The feeding attackman can dodge from side to side behind the goal as he keeps his head up looking for cutting teammates. The east-west dodging allows the attackman to keep his hands free from the defenseman making any checks. 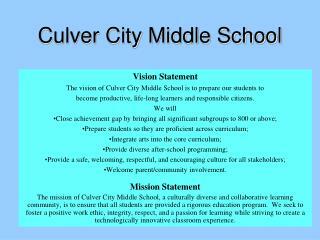 There are some simple rules that teams should have for making feeds. The first rule of feeding is to never throw off the back foot. Many times when an attackman throws off his back foot, the pass is too soft and easily read by the defense, and gets intercepted. Another rule is that feeds can not be made from too far away. When attackmen throw feeds from the goal line or from way outside on the side of the field, the feed is likely to be intercepted. Finally, forcing feeds to try and get an assist is just as bad as being a ball hog.